participants. Those of us championing programs like AMOB are inspired by our personal connections to the programs. In an effort to expand AMOB into more traditional health care sectors, two universities in Texas are working in conjunction with community organizations and Area Agencies on Aging (AAA) to connect future health care professionals with AMOB. 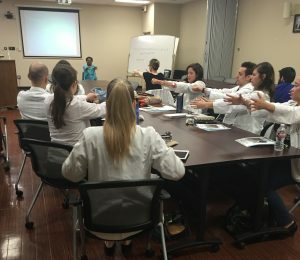 For more than three years, the Texas A&M Health Science Center School of Public Health Program on Healthy Aging and the College of Nursing, in conjunction with the Brazos Valley Area Agency on Aging, have been working together to train nursing students to conduct AMOB workshops. Nursing students are trained through the Program on Healthy Aging (see video here!) and provided with opportunities to facilitate workshops, which fulfills necessary course requirements in aging for their degree plan. Students report that they enjoy the time spent with older adults and see the concepts and tools of AMOB as valuable assets to carry into their future professions. This innovative approach to introducing health care students to community-based EBPs early in their career provides a foundation for future work between community organizations and health care providers. Ultimately, this will benefit older adults in the community by providing them with greater access to comprehensive healthcare and resources. ← Find a Fall Prevention Program!